Overnight short breaks are short-term care provided by someone other than the parents or the usual carers of the child. They are fundamental to keeping both me and my family happy and healthy. My boy has ‘continuing healthcare’ and an extensive care package, which means he receives 7-nights of care per week, from 10pm-7am, and 6 hours of day care per week. Some of this can be used at our local overnight short breaks centre. Although some people might say that we don’t need overnight short breaks because of the amount of support we get, I would argue the opposite! For me and my family, they are essential. That’s because although we appreciate any help we get at home, it’s not the same as having a rest. Just because a carer is sitting with my son, giving him his nebulisers, monitoring his seizures, checking his feed, or ensuring his oxygen is at the right rate, it doesn’t mean I can’t hear his alarms and seizures when I’m trying to sleep. In fact, whenever I hear them, I wake up. I wonder if the carer will be calling for me to assist and assess. And, sometimes I wander down there to check on him anyway. When he is at his overnight short breaks centre, those alarms and seizures are monitored by nursing and support worker staff. I know that he is receiving the medical care he needs and I can sleep peacefully. Receiving care at home means that I cannot decide to go to bed early or sleep in. An overnight short break means I can do both if I wish and really catch up on quality sleep. Essentially, it means I am allowed to be an adult! I am not bound to another person’s schedule; I can make my own decisions. 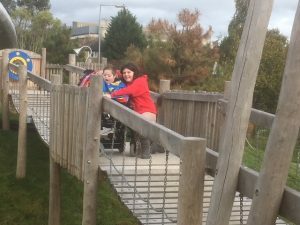 For my son, overnight short breaks mean that he can interact with children in a way he wouldn’t normally be able to. He can sit around a table and ‘have tea’ with his friends. He can have a play date after school in a safe setting that can accommodate multiple wheelchairs! He can have a sleepover at a place that is large enough to have multiple hospital-style beds! He can attempt to have a ‘normal’ life and time away from home with some of his favourite people (nurses/carers). Without these facilities, he won’t be able to go to a friend’s house, he won’t be able to have play dates, and he can’t sleep over at anyone’s house. 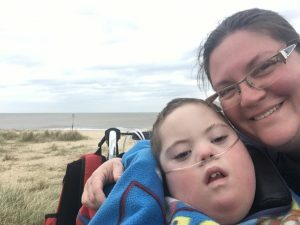 His medical needs are too great, but the overnight short breaks centre allows him to be a normal little boy as much as possible and tend to his additional needs. It’s impossible to quantify how much we benefit from our local overnight respite centre. It means that for a short while, we all get to be normal. It may not be under normal circumstances, but it’s the best we can get.